"Adventure story" redirects here. For the play, see Adventure Story (play). Adventure novels and short stories were popular subjects for American pulp magazines. Adventure fiction is fiction that usually presents danger, or gives the reader a sense of excitement. Variations kept the genre alive. From the mid-19th century onwards, when mass literacy grew, adventure became a popular subgenre of fiction. Although not exploited to its fullest, adventure has seen many changes over the years – from being constrained to stories of knights in armor to stories of high-tech espionages. Examples of that period include Sir Walter Scott, Alexandre Dumas, père, Jules Verne, Brontë Sisters, H. Rider Haggard, Victor Hugo, Emilio Salgari, Louis Henri Boussenard, Thomas Mayne Reid, Sax Rohmer, Edgar Wallace, and Robert Louis Stevenson. Adventure novels and short stories were popular subjects for American pulp magazines, which dominated American popular fiction between the Progressive Era and the 1950s. Several pulp magazines such as Adventure, Argosy, Blue Book, Top-Notch, and Short Stories specialized in this genre. Notable pulp adventure writers included Edgar Rice Burroughs, Talbot Mundy, Theodore Roscoe, Johnston McCulley, Arthur O. Friel, Harold Lamb, Carl Jacobi, George F. Worts, Georges Surdez, H. Bedford-Jones, and J. Allan Dunn. 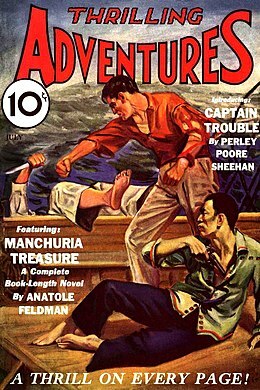 Adventure fiction often overlaps with other genres, notably war novels, crime novels, sea stories, Robinsonades, spy stories (as in the works of John Buchan, Eric Ambler and Ian Fleming), science fiction, fantasy, (Robert E. Howard and J. R. R. Tolkien both combined the secondary world story with the adventure novel) and Westerns. Not all books within these genres are adventures. Adventure fiction takes the setting and premise of these other genres, but the fast-paced plot of an adventure focuses on the actions of the hero within the setting. [according to whom?] With a few notable exceptions (such as Baroness Orczy, Leigh Brackett and Marion Zimmer Bradley) adventure fiction as a genre has been largely dominated by male writers, though female writers are now becoming common. Adventure stories written specifically for children began in the 19th century. Early examples include Johann David Wyss' The Swiss Family Robinson (1812), Frederick Marryat's The Children of the New Forest (1847), and Harriet Martineau's The Peasant and the Prince (1856). The Victorian era saw the development of the genre, with W. H. G. Kingston, R. M. Ballantyne, and G. A. Henty specializing in the production of adventure fiction for boys. This inspired writers who normally catered to adult audiences to essay such works, such as Robert Louis Stevenson writing Treasure Island for a child readership. In the years after the First World War, writers such as Arthur Ransome developed the adventure genre by setting the adventure in Britain rather than distant countries, while Geoffrey Trease, Rosemary Sutcliff and Esther Forbes brought a new sophistication to the historical adventure novel. Modern writers such as Mildred D. Taylor (Roll of Thunder, Hear My Cry) and Philip Pullman (the Sally Lockhart novels) have continued the tradition of the historical adventure. The modern children's adventure novel sometimes deals with controversial issues like terrorism (Robert Cormier, After the First Death, (1979))  and warfare in the Third World (Peter Dickinson, AK, (1990)). ^ a b D'Ammassa, Don. Encyclopedia of Adventure Fiction. Facts on File Library of World Literature, Infobase Publishing, 2009 (pp. vii–viii). ^ Green, Martin Burgess. Seven Types of Adventure Tale: An Etiology of A Major Genre. Penn State Press, 1991 (pp. 71–2). ^ a b Server,Lee. Danger is My Business: An Illustrated History of the Fabulous Pulp Magazines. Chronicle Books, 1993 (pp. 49–60). ^ Robinson, Frank M. & Davidson, Lawrence. Pulp Culture – The Art of Fiction Magazines. Collectors Press Inc 2007 (pp. 33–48). ^ a b c d e f Butts, Dennis,"Adventure Books" in Zipes,Jack, The Oxford Encyclopedia of Children's Literature. Volume One. Oxford, Oxford University Press, 2006. ISBN 978-0-19-514656-1 (pp. 12–16).